Once upon a time there were two boys: Caden and Darko. Both had been taught by their parents to set goals and they were excited to set some of their own. Caden was so excited he set 8 goals! He knew it would be too hard to do all of them at once so he chose 3 to start with. As soon as he accomplished one, he would start working on the next goal on his list. 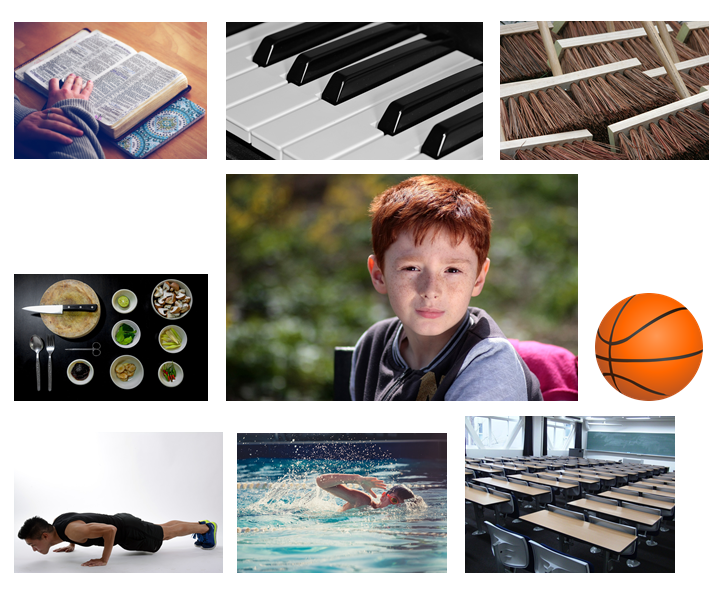 Caden worked hard to achieve his goals, never gave up, (no matter how boring or hard something was) and got all 8 talents – he learned how to swim, sweep, play basketball, play piano, do his best work on all his homework, do push-ups, cook, and memorize scriptures. Darko quit when it got hard or when he thought something was boring. He started a goal with enthusiasm, but didn’t put in the work necessary to get good at anything. Of the 10 goals he set, he only ever got good at one – running – because it was easy for him and he liked it. Because Caden knew how to swim, he could go in the deep end with his friends, dive underwater to pick up pennies on the pool floor, and he learned how to dive. Darko didn’t work hard at swimming and he always had to wear a life jacket. He wasn’t as fast as his other friends so it was hard to keep up and play with them. He also couldn’t play any games where he had to go under the water. Swimming was not very fun for him. Caden often got frustrated with his piano pieces, but he kept practicing every day no matter how hard the pieces were or how boring some of them seemed to be. In time, he got to be really good and he found that playing the piano helped him feel happy and peaceful when he was angry or sad. He was also able to teach piano lessons when he needed some extra money as a teenager. Darko loved how the piano sounded, but it was too hard to get all the notes right. Playing video games was more fun than practicing piano so he spent his afternoons playing video games. His piano teacher wasn’t happy that he hadn’t practiced and he rarely passed off his pieces so he quit. Caden made it a goal to read his scriptures every day and memorize one scripture a week. He found the scriptures helped him make good decisions and not give in to peer pressure. They also helped him have good, uplifting thoughts during the day. Caden decided to serve as a missionary for his church. He served many people and when he found out their struggles in life, he was able to share scriptures with them and explained how those very scriptures had helped him in his life. He was also an excellent cook so he ate well on his mission and was never hungry. Darko also served as a missionary for his church, but he was constantly hungry because he didn’t know how to cook and buying prepared food was expensive. He ended up eating the same, cheap foods every day which, after a while, didn’t taste very good and didn’t help his body feel good. He didn’t know the scriptures well and it was hard to help people with their problems. After their missions, Caden got into medical school because he had always worked hard in school and listened to his teacher. He signed up for honors classes and college-credit classes. Darko just goofed off and only half tried on assignments. He always signed up for the easiest classes. Darko wanted to be a doctor too, but they told him he couldn’t go to medical school because he didn’t know enough. He became a garbage man (at this point in the story, my second oldest felt bad for him and asked if he could become a fire fighter, but I said, “No, he didn’t work hard enough to become a fire fighter. He was lazy. He was a garbage collector.” I think it’s important that kids have a HUGE contrast in consequences to clearly drive the point home). Who had a happier life? Who was able to help more people? Who was more proud of themselves (had a higher self-esteem)? Caden! The one who set goals! Darko had a very low self-esteem. He didn’t feel proud of himself because he had never worked hard to accomplish anything to feel good about! All he could do was run and collect garbage. He wasn’t able to help many people because he didn’t have the skills to help them. He didn’t even have the skills to help himself for that matter. When he turned 18, he was, by legal definition, an adult, but he couldn’t hardly do any of the things we would consider basic fundamentals of being an adult. I told this story to my boys at the very beginning of the Summer because my husband and I didn’t want them to be lazy and just waste their Summer away. We wanted them to go back to school feeling proud of all they had accomplished and learned this Summer. After hearing the story about Caden and Darko, my boys were excited to set some goals. I had them draw the goals they wanted to accomplish and we hung them up on a poster. This Summer my oldest (who is 7) can jump rope 52 times, do 67 push-ups (not all at once – he does 3 sets of push-ups, but he can do 30 push-ups in a row! ), learned how to swim, has memorized 5 scriptures, has learned how to find scripture references and mark scriptures, and has set a goal to read the entire Book of Mormon before his 8th birthday. My second oldest (age 5) has learned how to swim, play soccer, and play basketball, At first, he couldn’t even dribble the basketball 5 times in a row, but now he can dribble it 100 times in a row. He is working on his running goal – he wants to be able to run for 1 mile without stopping. He has memorized one scripture. My two-year-old got a free pass this Summer. We’ll try and see if she can set some goals next Summer. My boys didn’t accomplish all of their goals. My oldest still doesn’t know how to ride a bike and we didn’t have time to work on his running goal. He also set a goal to learn how to make pies, but we are waiting for Grandma to visit for Thanksgiving =) She’s the master pie maker. The BEST part, by far, is to see the joy on their faces when they can swim the length of the pool or dribble the basketball 100 times. The joy is even greater when they had to work extra hard or long to accomplish it. They have developed many new talents this Summer and I couldn’t be more proud of them. I was pleasantly surprised at how motivated they were to accomplish their goals. It wasn’t very hard to make them practice (I basically just set a timer for 10 minutes a day and had them work on a goal) because they had ownership. It wasn’t MY goal. It was THEIR goals and they were internally motivated to accomplish them. There were times, of course, when they complained their goal was too hard or when they asked if they could watch a movie instead. At those times, we re-visited the story of Darko and Caden. My boys have really learned that hard things will always remain hard if you don’t practice and that hard things will eventually become easy if you do practice. I made sure the goals were their own ideas. I gave suggestions, but didn’t push anything on them. I did, however, make them do math and reading every day. They didn’t set any educational goals so I set a goal for myself to help them not forget everything they had learned in school this year =) It’s funny because, although they are much better at reading and math, they don’t feel any sense of accomplishment, but I DO!!! They have fought me much more on doing math and reading (so next Summer they’ll be required to set some educational goals =), and seeing their lack of enthusiasm and lack of excitement about their progress has really driven home, for me, the crucial need for having ownership of your own goals. 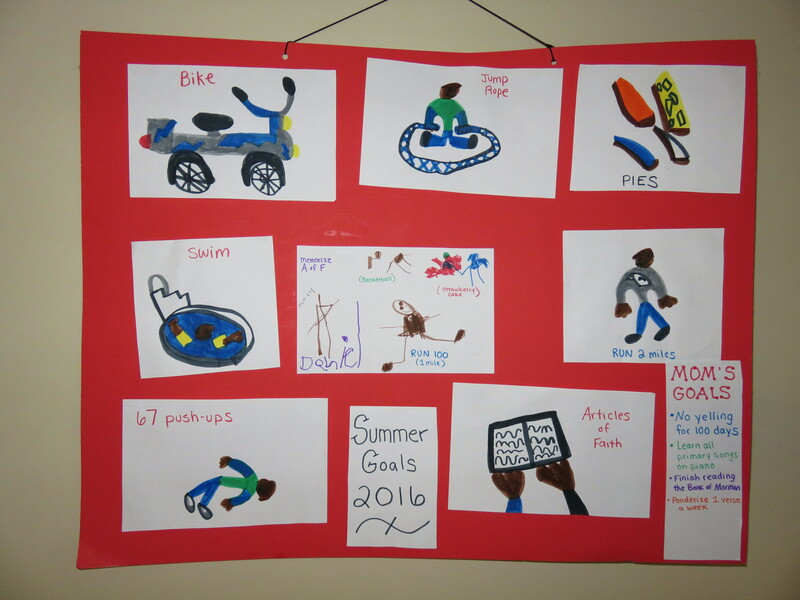 Our Summer goal chart has worked so well that we’re going to keep the goal poster and set some goals for this Fall. This entry was posted in Parenting, Spiritual Nourishment and tagged Goal Setting, Goal Setting For Kids, Goals by egbertelizabeth. Bookmark the permalink.